January 21, 2008  American poet and musician Gil Scott-Heron, best known for his song "The Revolution Will Not Be Televised," reads from his new book about the Martin Luther King, Jr., holiday and talks about what it means to conduct a revolution. December 11, 2007  Since writing poetry as a teenager and making his first foray into songs on 1970's 'Small Talk at 125th & Lenox,' Scott-Heron has merged message and music in a manner that's influenced countless activists and artists. Hear an interview and performance from WFUV. 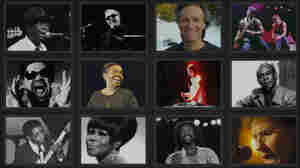 December 30, 2011  Morning Edition and NPR Music look back at some of the musicians who died in 2011, including Amy Winehouse, Paul Motian, Cesaria Evora, Clarence Clemons and more. 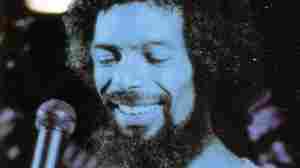 May 28, 2011  Gil Scott-Heron's messages took on racism and called for self-determination for people of color. 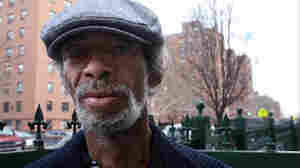 February 11, 2010  Gil Scott Heron is a poet and singer/songwriter known for his politically charged work in the 1970s. Many consider him a forefather of modern rap for the way he merged inner-city poetry and jazzy soul music. He's been out of the spotlight in recent years, but has just released a surprising new record. February 5, 2010  His hugely influential 1971 spoken-word piece "The Revolution Will Not Be Televised" has inspired generations of imitators. Today, after multiple stints in prison, Scott-Heron returns with a more introspective collection of music: I'm New Here. It's his first new recording in 16 years.